I have tried to learn to swim a few times but I sink like a rock. I want to succeed this time so any help would be greatly appreciated. Your determination to succeed is to be admired. Learning to swim will open up many very pleasurable avenues in life as well as many health benefits. The 'sinking like a rock' feeling is very common even in beginners that can actually float. The trick is to relax, which I’m sure you have been told to do a few times before now, but relaxing in the water is easier said than done. Everything you need is covered in The Complete Beginners Guide To Swimming, including how to relax, float and breathe. Click here or the download link at the bottom of this page. If you are even slightly anxious or nervous about swimming then your muscles will tense and your movements will be awkward and almost robotic. So how do we learn to relax? Quite easily once you have practiced some basic stages. The water is a completely unnatural environment for us human beings to be in and the most unnatural part is being under the water. We cannot breathe, we are not fish! If we can understand and learn how our body behaves in the water and how to become comfortable with being submerged then swimming along at the surface will be a whole lot easier. First thing to learn is how to hold your breath and submerge. Do this standing in water of about shoulder depth and hold your breath for about 5 seconds if you can. If you are not comfortable with this at all then start with holding your breath and lowering your mouth and nose into the water but keep your eyes out. Next stage is to hold your breath, submerge and then allow your feet to come up from the pool floor. The air in your lungs will assist your floatation and if you lay forward slightly you may find your feet come up from the floor. You may want to do this near to the poolside or even holding the poolside so that you are able to easily stand up again. Once you have become comfortable with all of this then try it away from the poolside and learn to stand up for yourself. Notice so far we have done no swimming as such. All we are doing is learning to relax so that we can help our body remain at or near the water surface when we do actually swim. Learn to submerge, lift your feet off the pool floor and then regain your standing position again. The more you practice this the more relaxed you will become in the water. When it comes to adding some arm pulls and leg kicks, for whatever swimming stroke you wish to learn, a combination of your relaxation and your movement through the water will prevent you from sinking. There is one very important aspect to swimming that is very often misunderstood and it is key to relaxing and swimming with ease. Do not fight your way through the water. You must feel you way through it. If you try to swim slowly you will find you can swim just as far using half the energy than if you thrash around trying to swim fast. Relax and take your time and your success will come. 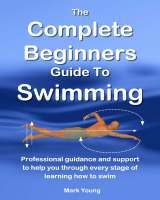 My ebook The Complete Beginners Guide To Swimming contains all of the essential basics of swimming that you need, including how to relax, breathe and float. Click the link below for more information.